We mothers have all been there. The ‘bad’ days when we are on edge; cranky, moody and irritable; the day the children repeatedly overstep their boundaries until one of two things happen: either we snap, or something breaks irreparably. That is when all our anger-management vows and self-help resolutions go out the window, making us deliver a tight whack anywhere on that tiny body; one producing a resounding bawl that can probably be heard by the neighbors down the street! Nevertheless, truth be told, this method of discipline does nothing to improve our lot. Not only do we have to deal with the resulting mind-eating guilt for the rest of the day, but we also have to spend the next half hour soothing and comforting a crying, clingy, inconsolable child hurt by our lack of parental self-control. The worst, most unfair mode of ‘discipline’ is when a mother off-burdens her seething anger or frustration at some other problem in her life – financial constraint, oppression from in-laws, or a tiff with her husband – on her innocent children, making them scapegoats. A little knowledge of why a child is behaving a certain way goes a long way in handling his or her tantrums and mischief. For example, a toddler becomes destructive if his mother is distracted and does not show him her usual love; he might throw something at her, or do something she dislikes just to get her attention – albeit the angry type. A teenager going through some bodily changes will become moody, unresponsive and distant. Our children need us, their mothers, to be sympathetic, accepting and accommodating of their changing behavior during the different challenging phases of their lives. We can discipline them better if we know why they did something wrong in the first place. Ask yourself: (i) Have I been giving my child less attention than before, due to some other worry/occupation? (ii) Has my child been facing the repercussions of family circumstances, e.g. a move, economic recession, or a job change? The best way, hands down, to discipline energetic, spirited children is to keep them occupied with constructive activities – providing them alternatives in place of the no-no’s. For example, a toddler writing on the walls is not deliberately disobeying you; he is just giving in to the urge to write/draw, which is a positive developmental milestone! So provide him with paper, chalk/blackboard, crayons and pencils, along with a small, custom-sized desk and chair. Your “lazy” teenager is watching television all day because he has nothing else to do. So delegate chores or enroll him in a youth summer camp. Be discrete: It is not very wise to glare with dagger eyes or shout at a child in front of others as soon as he or she does something wrong. Wait, take them aside, and quietly reprimand them. Keep it short to have more impact. Scolding them in public or lecturing them like a drone, are common disciplinary faux pas that, more often than not, backfire and detriment the parent-child relationship. Make them apologize: After making your child realize that they did something wrong, teach them gently how to apologize to someone they wronged, e.g. if they hit another child, or called them a bad name. Teach them how to say “I am sorry for __ ”. Ask them to make amends: If they made a mess, spilled food/drink somewhere, or broke something, ask them to make amends by cleaning up and restoring the place/thing to its original state. This will teach them how to compensate others for a loss they caused, as well as to clean up after themselves like civilized, well-mannered people with good social etiquette. Temporarily take away privileges: This is one of the most effective, non-confrontational methods of disciplining younglings. Taking away their “perks”, such as a prized set of markers, a shiny new storybook, or a favorite weekly outing, will make them “pay” for deliberately breaking a rule or disobeying elders. In the future, this cause-and-effect lesson will make them hesitate before repeating the misdemeanor. However, remember to return their “perks” after they have rectified their behavior! 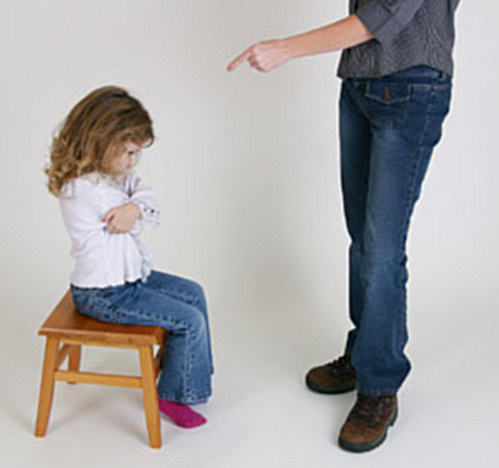 Time out: Giving a naughty child a “time-out” is a popular contemporary disciplinary technique used with very young children. It involves isolating the child for within one to five minutes – never longer – on a specific mat, chair or corner in a room, to sit by himself quietly with his back to everyone else. The main factor that makes a difference in disciplining children and teenagers is making sure they know that the parent is inherently sympathetic and has their best interest at heart. That is why a parent must always follow up a reprimand or disciplinary measure with a compensational expression of love and compassion, as reassurance. Warm, homemade brownies with a big hug, for example, would definitely achieve this, and help seal the promise of sincere well wishing in the relationship!